This five-sided box painted in the traditional Palekh style is a creation of Vladimir Bogdanov. “The Tale of the Dead Princess and Seven Bogatyrs” written by Alexander Pushkin has been chosen as a subject for the work. Each of the box's sides shows a certain episode from the tale. The box's rear side shows the moment when the Dead Princess's stepmother, the wicked queen, ordered her servant to kill the girl. On the box's left side we can see how the queen's servant managed to perform her crime: she left the girl alone in the forest to be eaten by wild beasts and birds. The front side depicts seven bogatyrs who found the Dead Princess sleeping in their house. On the box's lid Bogdanov painted the moment when Prince Yelisey asked the Sun where he could find the Dead Princess. The box's right side shows Prince Yelisey awakening the Dead Princess with his kiss. The work is painted in green, brown, blue, and brown tones of tempera paints. Each scene is neatly detailed with brilliant gold and silver paint. Gold and silver paint is also used to decorate the box's exterior with luxuriant filigree patterns. The box is constructed from paper-mache. 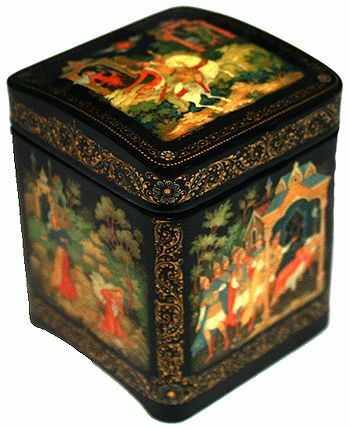 Black lacquer is used to paint the exterior of the box while red lacquer completes the interior of the work. The lid is hinged, and the box rests on two legs. The work is signed with the artist's name, the year of 2009 and the village of Palekh.